The gold chart above covers the entire month of July, 2017. 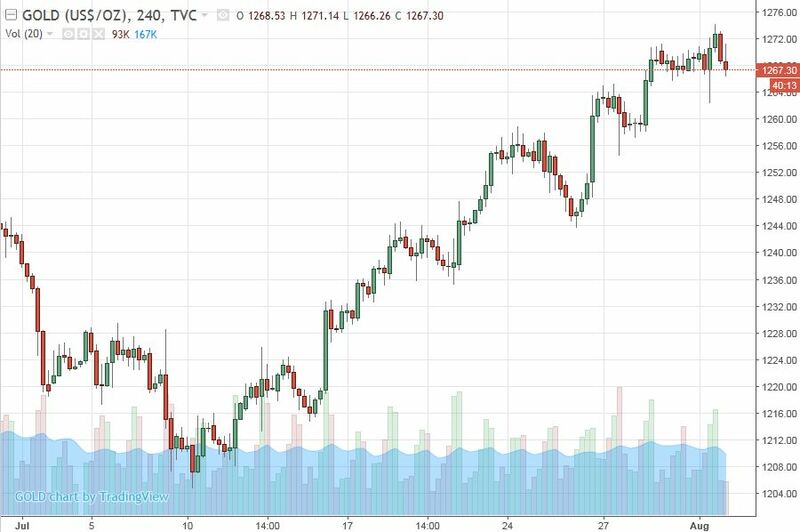 Please note that after 10 July 2017, gold has been in basically an upward trajectory, from a low of 1205 to a recent high of 1274. 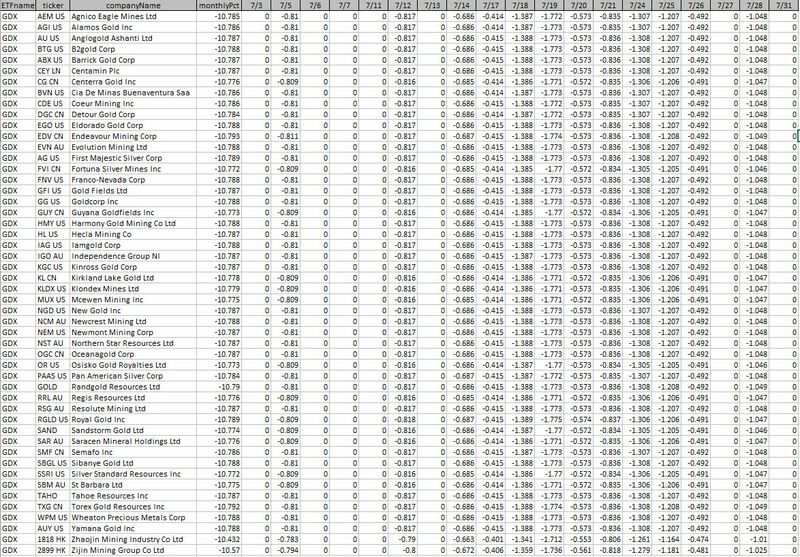 However, the data below is the daily percent change in number of shares held for each of the component stocks for GDX ETF. What I find very interesting is that every day where there was activity by GDX, it was all selling of stocks -- never a day where they bought shares. The activity was quite consistent across all of the component stocks. For example, on 7/3 there was no activity, but on 7/5 each component stock's holdings was reduced by -0.81%. The minor variations between each stock is due to a combination of rounding accuracy, actual trading fill quantity, and with the Hong Kong stocks a timing difference due to time zones when those exchanges are open. Over the entire month of July, 2017, each component stock's holdings was reduced by -10.78%. The total market value for GDX at the start of July was $8.01B and at the end of the month it is $7.57B for a net loss of -$441.2M. All of this while gold and silver were rallying. I would have also included charts and fund flows for GDXJ, but apparently VanEck did not do any trading for GDXJ for the entire month of July. I find this rather absurd and very unlikely -- I downloaded each of the daily holdings reports for GDXJ and the number of shares holdings did not change at all, the individual stock valuations changed as well as the weighting values, but not the holdings. Is VanEck withholding this data? The fund flows for GLD, GDX, and NUGT are all predominantly outflows for the entire last half of July. 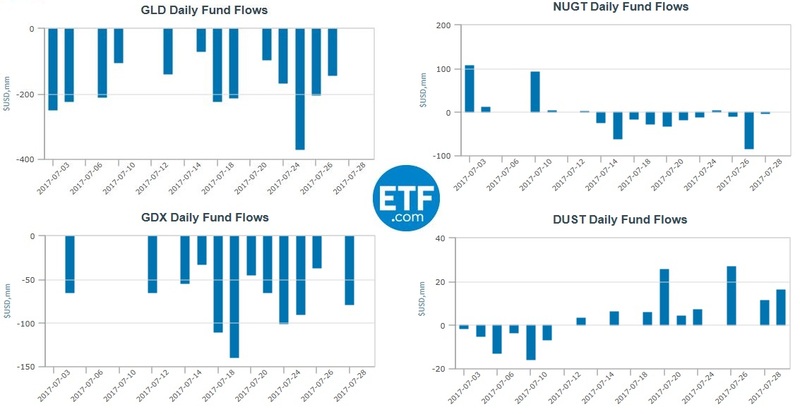 DUST, which is the 3x inverse of GDX, shows net inflows for the same period. This strongly suggests to me that the outflows were not simply because there were competing commodities that drew traders away from gold stocks, but since DUST actually had significant inflows suggests the traders were quite bearish on gold stocks while gold itself was rallying. 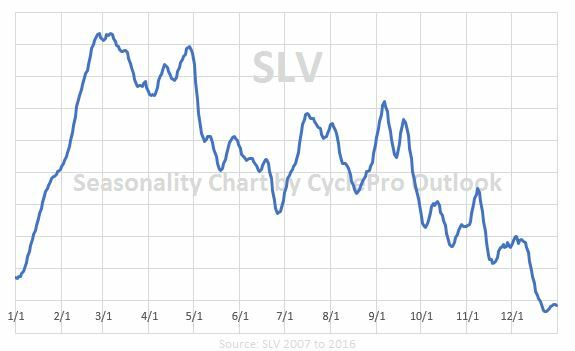 The Gold Miners Bullish Sentiment index (above) shows only 25% bullish after an earlier low of 17.5%. Relatively speaking, these are very low sentiment readings. Traders have been quite bearish on gold stocks even as the commodity gold price has been rising. Apparently, traders don't believe gold's recent price rise is sustainable. Competition from other "investments". For example, the Bitcoin fork fear bottomed on 16 July 2017, after which it has experienced a substantial rally. Perhaps some GDX funds flowed into Bitcoin, Ethereum, or one of the numerous alt-currencies. Perhaps all of this negative sentiment will change very soon. 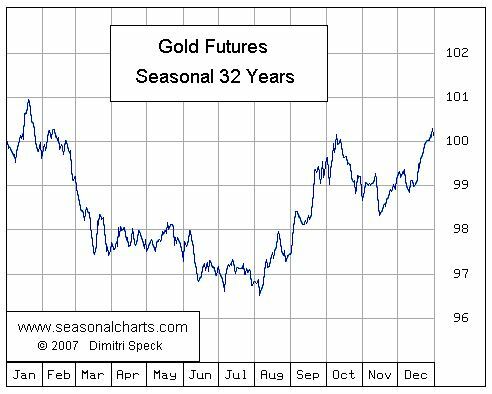 The following seasonality chart for Gold from Seasonax suggests that the year low tends to occur during the first week of August. Since the Seasonax chart only contains data thru 2007, I decided to create my own. 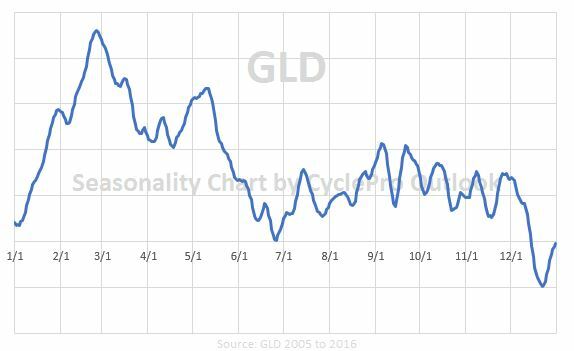 The following are for GLD and SLV which gives seasonality a little different perspective.